A Milwaukee garden its creators hope to never fill gets another child's name added. Noelani Robinson, 2, was found dead after a nationwide Amber Alert. A vigil was held for her Tuesday night in a memorial garden where other children of violence are also remembered. MILWAUKEE — A Milwaukee garden its creators hope to never fill gets another child's name added. Noelani Robinson, 2, was found dead after a nationwide Amber Alert. A vigil was held for her Tuesday night in a memorial garden where other children of violence are also remembered. Prayers and poems were read for Noelani. The two-year-old was found dead after an Amber Alert was issued for her last Monday. Her name is now in the Guardians of the Children Tree Memorial Park alongside the names of other child victims. "It doesn't get easy," said Margarita Fogl, wiping back tears. She is the grandmother of Laylah Petersen. She came out Tuesday for Noelani. Laylah Peterson's name was the first to be added to the park. She was killed by a stray bullet in 2014 that went through her home while she sat on her grandfather's lap. Fogl has since become a member of the motorcycle club, Guardians of the Children the group that founded the memorial garden. "They are there for babies that can't have voices. They are there for babies that have been murdered," said Fogl. The Guardians will attend Dariuz Higgins' court hearings. He is facing murder charges for shooting Noelani's mother, Sierra Robinson, who was in Milwaukee to pick up her daughter. The head of Milwaukee's Office of Violence Prevention Reggie Moore said change is needed if the community wants to stop the pain of these vigils. "We have a crisis in terms of the way we treat women and girls in this community," said Moore. "We have an issue as men that we need to grapple with and hold each other accountable to." As the guardians and community members remember Noelani, Fogl said the focus now is getting her justice. "We are there for the victims, which are the children," said Fogl. 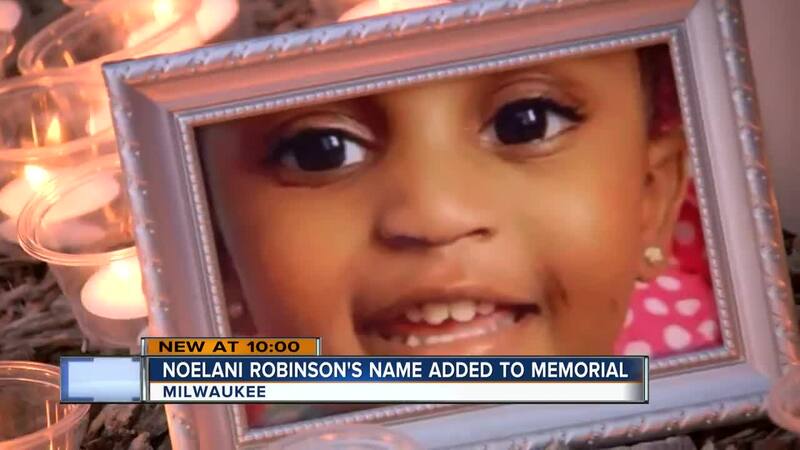 No one has been charged in Noelani Robinson's death. The investigation is ongoing.